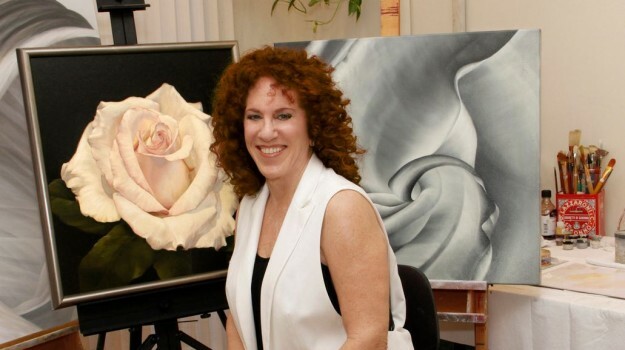 (Boca Raton, FL – September 22, 2014) The Adolph and Rose Levis JCC’s Nathan D. Rosen Museum Gallery will exhibit the paintings of internationally renowned painter Deborah Bigeleisen from March 8 through April 30, 2015. The gallery is located at the Levis JCC’s Phyllis & Harvey Sandler Center for Jewish Life Enhancement at 21050 95th Avenue S. in Boca Raton. The title of the exhibition is MULTIPLE PERSPECTIVES: the Evolution of an Artist’s Vision which traces the path of the artist’s focus from creating Rembrandt-like portraits of white roses to her more evocative contemporary views that are an abstracted fractal of the original floral form although still suggestive of its organic roots. Though her paintings have been mentioned alongside Georgia O’Keefe, Bigeleisen brings a unique and distinctive 21st Century perspective to the floral genre. FACTOID: Deborah Bigeleisen often signs her paintings on the side and not on the front so that they can be hung in whatever direction suits the collector’s eye. In addition to the free Artist’s Talk on March 8, Ms. Bigeleisen will also present a talk on “The Art of Buying Art” on March 25 at 7:30 p.m. The cost to attend is $10 for JCC members and $15 for non-members. Flowers and nature have been the inspiration for Deborah Bigeleisen’s artistic expression since childhood, and are the common thread that weave through both her careers: first as a textile print designer and founder of her own global design company in NYC, and later as a fine artist which she began in 1998 upon moving to West Palm Beach, FL. In the early years of her painting career she was mentored by acclaimed technical master Sam Perry and guided by renowned visionary Gordon Parks. She also completed rigorous training through Master Artist Workshops. From early on, Ms. Bigeleisen’s work gained the attention of fine art dealers across the U.S. from San Francisco and Austin to New York City and Southampton. Her paintings are collected world-wide both privately and publicly, enhancing the corporate collections of American Airlines, Beauté Therapies Inc., and LBC Design & Construction and more. Her paintings have been accepted into numerous museum exhibitions including the Society of the Four Arts, the Boca Raton Museum of Art, and the Williamsburg [Brooklyn, NY] Historical Center; have received awards in international competitions; and have graced the covers and interior pages of publications including Michael K. Corbin’s three part series “A Collector’s Journal,” Florida Design, New Art International, and Art & Antiques. In addition, her conceptual work in fractals has been published in the prestigious journal Science Creative Quarterly. Ms. Bigeleisen’s paintings are sold through fine art galleries, and have been prominently exhibited in international Contemporary and Fine Art fairs including the Architectural Digest Home Design Show, ArtHamptons, the Chicago International Art Show, the LA Art Show, the Palm Beach Jewelry, Art and Antique Show and the Shanghai Art Fair. For more information, please visit deborahbigeleisen.com.